So many of the immediate challenges facing the next Presidential Administration will require solutions based on sound, reliable science. Federally-supported scientific research—including social and behavioral science research—provides an evidence base that the President and Executive Branch agencies can use to produce science-backed strategies for addressing issues of national importance, such as crime prevention, health care for the underserved, the safety of our troops, early childhood education, and improved efficiency of American businesses, to name a few. To achieve results in these and other pressing areas, the Trump Administration, working with Congress, will need to put science to work for the nation. Social and behavioral science research is an integral component of the U.S. STEM (science, technology, engineering and mathematics) research enterprise. Though often misunderstood and underappreciated, federally-supported social and behavioral science research makes meaningful contributions to nearly every aspect of American life. 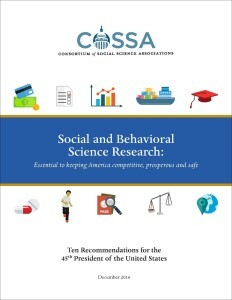 The Consortium of Social Science Associations (COSSA) is pleased to provide the following recommendations for how the Trump Administration and the 115th Congress can work toward achieving meaningful policy changes using the insights derived from social and behavioral science research. Additional information can be found on the COSSA website at www.cossa.org and at www.whysocialscience.com.